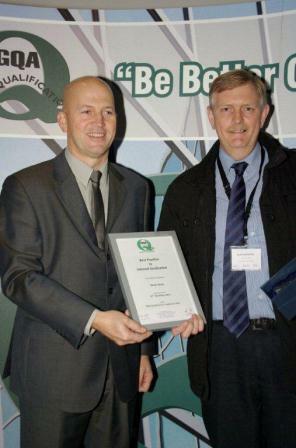 GQA took the opportunity to again recognise good practice by GQA Approved Centres at the GQA Approved Centre Awards, held as part of the recent GQA Conference. There were 3 Awards presented, with nominations coming from GQA External Verifiers and Staff. This was again a difficult decision to come to, with all nominations being backed by strong rationale. GQA also presented certificates to mark milestones with the 1st GQA QCF Achiever working through Auto Windscreens and the 1000th GQA QCF Achiever working with IVS Ltd. Chris Bonsall of Auto Windscreens and Ty Priestman of IVS Ltd are pictured below with their certificates.